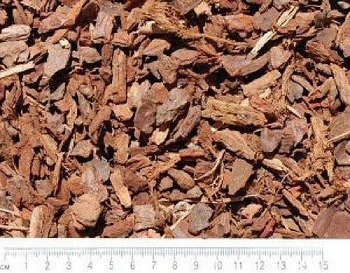 A 3-15mm matured pine bark chip, mid to dark brown in colour, with virtually no fines designed for incorporation into peat-based or peat-free growing media, to improve air-filled porosity and long-term structural stability. This product is from FSC Mix Sources at a minimum of 70% and is Soil Association approved. An excellent long-lasting pot mulch to suppress weed, moss and liverwort growth. Coarse enough to present a dry surface and allow free passage of irrigation. Free-flowing, easily covering the entire surface of the pot with no gaps. Evenly graded and very easy to apply either by hand or by machine. Non-damaging to stock - non-phytotoxic and no restriction on protected crops.